On Christmas night 1776 George Washington and twenty-four hundred men stepped off from the Pennsylvania side of the Delaware River to cross the icy waterway. They went on to win a decisive victory at Trenton, New Jersey, and then later at Princeton. The battles changed the course of the Revolutionary War. The first official efforts to memorialize the heroic event began in Pennsylvania in 1895. A park commission was created in 1917, and they formally dedicated the park in 1921. The park includes the historic shoreline, the McConkey Ferry Inn and Thompson-Neely House. Both buildings played a role in that fateful evening. 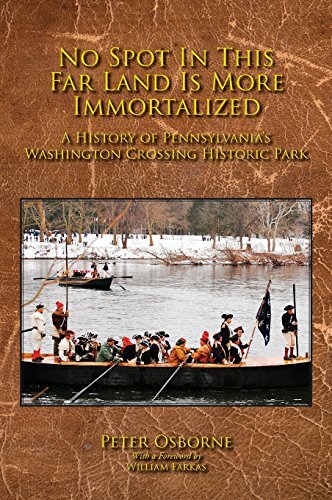 Over the years millions of visitors have come to the park and contemplated the Crossing, the famed painting of Washington Crossing The Delaware by Emanuel Leutze, picnicked on the grounds, played on the sports fields, and walked their dogs. Visitors have also enjoyed the beauty of the Bowman's Hill Wildflower Preserve, and climbed to the top of the Bowman's Hill Observation Tower. Find out why this park is one of the jewels in the crown of the Pennsylvania Historical and Museum Commission's historic sites.